Video directed by Marty Nee. Photos by Lauren Termini, Ximi Bobadilla, and David Kinchen. 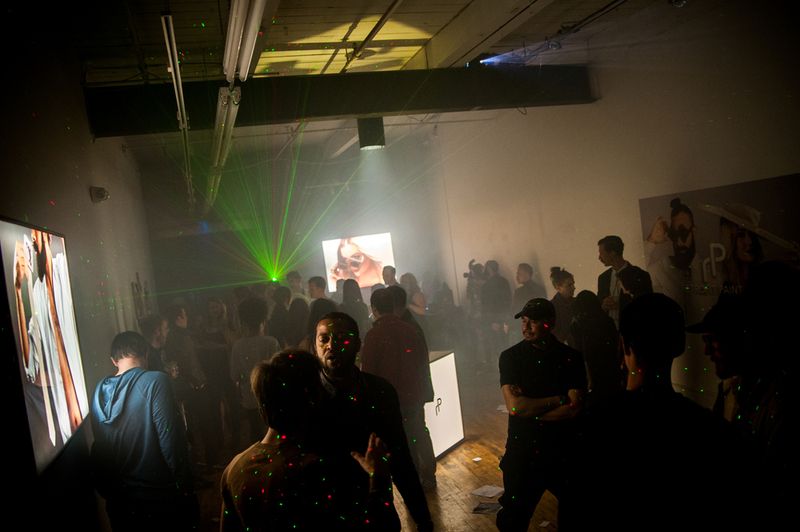 Fine art gallery, acrylic gesso, linen, oak, brass, gold plexiglass, LEDs, lasers, video projection, photo light boxes, DJ, alcohol sponsor, bars, bouncer, photo booth, flyers, fog machines, line stanchions, bouncers, models, hype girls, dogs, e-commerce website, instagram feed, twitter feed, facebook feed, advertisement campaigns. final strokes of daylight folding into the dusk. Utopia for the senses, cornucopia of smiles, lies, and pies (?) Las Vegas has fascinated artists for decades, drawing them in with voracious crowds of regulars, and newbies alike. This is not a place for the socially anxious, or, maybe it could help heal precisely those, through its many initiation rites. Roll your dice. Some compare it to paradise, others to hell. Rumor has it Tom Waits hates Vegas more than Disneyland -- although, even he would have to admit, if there ever was a competition for decadence, this city would certainly win. Who knows what Baudelaire would have thought, as affected as he was, deeply seated in dark mélancolie. Venice of the desert, kingdom of desire, strewn with towering monuments dedicated to consumerism and fate: everyone's life can make a sudden turn, right here, right now. When the occasional bomb was dropped in the desert closeby, tourists could rent rooms in hotels that guaranteed panoramic views of the mushroom cloud. They'd sell Atomic cocktails at the bar -- what better way to contemplate the future that just passed? Once upon a time this place became Las Vegas, "the meadows," named by a Mexican traveler on his mid-day hike. Now there's spotlights and lasers crisscrossing the sky eternally. This city full of sighs, what a cacophony of sounds! Like a pulse that people scream into at the top of their lungs. Dry gusts of wind carried it all away, romantically, into the desert. There's clearly some glam fabulousness to all that, a fearlessness, except we don't see it as high culture. It's a grand performance, one of the most elaborate of all, attitude attitude attitude. "As an artist I can take these chances, make something absurd like this" Willis tells me in the throbbing disco lights, as we talk about painting and play, risks, and the possibilities therein. Painting, one of the oldest, and in many ways most traditional of mediums -- what can it do for us? How can we put to use the language, the technical means, the surfaces, in our most immediate lives? Once you apply the filter of the vernacular, everything can be turned into canvas, everything that isn't one already, that is. Ileana L. Selejan is the Linda Wyatt Gruber ’66 Curatorial Fellow in Photography, at The Davis Museum at Wellesley College. She received her PhD in Art History from the Institute of Fine Arts, New York University. Her work focuses on war and documentary practices, and the intersection of aesthetics, ethics, and protest in photography and art. Ileana also writes independently, and is a contributing member of kinema ikon. Whitney Houston, “I Wanna Dance with Somebody (Who Loves Me),” Whitney, Arista, 1987.